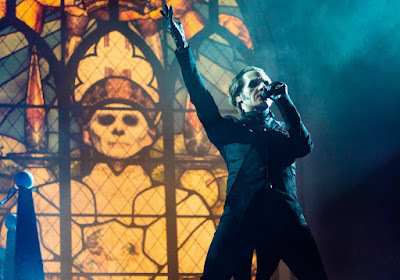 Ghost debuted a pair of tracks from the forthcoming album, “Prequelle”, in Riverside, CA on May 5, and video from the show has surfaced online. The Swedish rockers delivered "Miasma" and "Pro Memoria" during the first of two sets at the city’s Municipal Auditorium as part of the official opening night of a spring US tour following an intimate club show performance a night earlier at The Roxy Theatre in Los Angeles, CA that offered several new songs from the project. Due June 1, Ghost recorded their fourth studio album with producer Tom Dalgety (Royal Blood, Opeth) at Artery Studios in Stockholm, Sweden.